 European Black Alder (Alnus glutinosa) - leaves are indented at the tips, roundish.  Speckled Alder (Alnus incana) - leaves are double-toothed.  Alder-leaved Buckthorn (Rhamnus alnifolia) - not an Alder. Habitat: Fields and Open Areas, Wet Areas; Wet areas; also gravelly or rocky areas. Notes: Easily confused with the other Alders. Photographs: 71 photographs available, of which 10 are featured on this page. SCROLL DOWN FOR PHOTOGRAPHS. Upper side of a leaf. Note the small teeth. 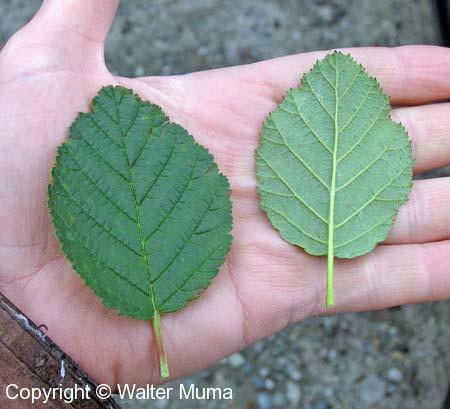 The leaf is not double-toothed like those of Speckled Alder (Alnus incana). The leaf is somewhat pointed. Underside of the same leaf. Upper side and underside of a Green Alder leaf. -European Black Alder (Alnus glutinosa) (R). Some Green Alder alongside a road in the north (James Bay Road website, Quebec). A less typical Green Alder leaf. 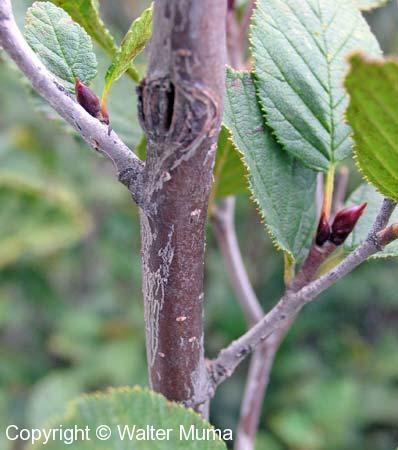 Bark and trunk of a Green Alder shrub.